May 22, 2012 - The Commemorative Air Force’s iconic Boeing B-29 Superfortress bomber, FIFI, the only remaining flying example of the aircraft in the world is coming to the Carolinas Aviation Museum in Charlotte, North Carolina on May 25. 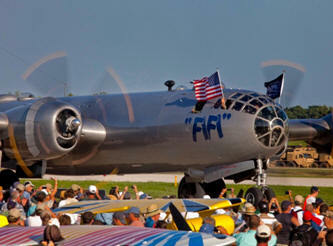 The B-29 will arrive with the B-24, Diamond Lil, an equally rare World War II bomber and one of only two still flying. The Brat III, an actual combat veteran P-51 Mustang from the Cavanaugh Flight Museum, will accompany the bombers. All three airplanes will be on display at the Carolinas Aviation Museum, 4678 First Flight Drive, Charlotte, North Carolina. The mission of the Commemorative Air Force is to honor the men and women who built, maintained and flew in these airplanes during World War II. The organization believes that mission is best accomplished by maintaining the airplanes in flying condition; taking the airplanes to the people allowing them to experience the sight and sound of the aircraft in flight. The Boeing B-29 Superfortress, first flown in 1942, began active service in 1944. It is perhaps best known as the aircraft from which the first atomic bomb was dropped. It was designed as a replacement for the older B-17s and B-24s, with longer range and greater bomb loads. The B-29 was also used in the Korean War in the early 1950s and was a staple of the U.S. Air Force until the late 1950s. FIFI was acquired by the CAF in the early 1970s when a group of CAF members found her at the U.S. Navy Proving Ground at China Lake, California where she was being used as a missile target. The airplane was rescued and restored and flew for over thirty years until 2006 when the chief pilot made the decision to ground her pending a complete power plant re-fit. What followed was an extensive four year restoration that included replacing all four engines with new custom built hybrid engines. FIFI returned to the sky in 2010 and since that time has traveled coast to coast attracting large crowds at every tour stop. CAF B-24A Liberator aircraft, built in May 1941, is the 25th B-24 produced by Consolidated Aircraft at their San Diego facility. On a training flight from Eagles Nest Airport, N.M., prior to its delivery to England, AM-927 experienced a landing accident. The damage was major enough that the aircraft had to be returned to San Diego for repairs. As a result of the accident, she was converted to a personnel and cargo carrier. During the war this B-24 flew scheduled runs between San Diego, Fort Worth, New York, and Washington D.C. She also carried various American and foreign dignitaries within the U.S. In 1969 the aircraft was purchased by the CAF and, in 1971, she was painted in the colors and markings of the 98th Bomb Group, Pyramiders of the 9th Air Force in North Africa, and was named Diamond Lil. The exhibit is sponsored by BAE Systems, Inc. and the Dowd Foundation and will be at Museum from May 25 to May 30. The exhibit will be open to the public on Friday, May 25 from 12 p.m. to 5 p.m.; Saturday, May 26, 9 a.m. to 5 p.m.; Sunday, May 27, from 12:00 p.m. to 5:00 p.m. and Monday, May 28, from 9 a.m. to 5 p.m. and Tuesday and Wednesday, May 29 through 30, from 10 a.m. to 4 p.m. Located at Charlotte Douglas International Airport, the Carolinas Aviation Museum's mission is to educate the public on the importance of aviation and inspire the next generation to excel academically in the areas of math, science, and history through the preservation of our aviation heritage. The museum has been collecting and restoring vintage historical aircraft for more than 20 years, and is the largest aviation museum between Washington, D.C., and Robbins, Ga. Collecting, restoring and flying vintage historical aircraft for more than half a century, the Commemorative Air Force ranks as one of the largest private air forces in the world. The CAF is dedicated to Honoring American Military Aviation through flight, exhibition and remembrance. A non-profit educational association, the CAF has more than 8,000 members and a fleet of 156 airplanes distributed throughout the country to 74 units located in 27 states for care and operation.